The lower extremity of the humerus is flattened from before backward, and curved slightly forward; it ends below in a broad, articular surface, which is divided into two parts by a slight ridge. Projecting on either side are the lateral and medial epicondyles. The articular surface extends a little lower than the epicondyles, and is curved slightly forward; its medial extremity occupies a lower level than the lateral. The lateral portion of this surface consists of a smooth, rounded eminence, named the capitulum of the humerus; it articulates with the cup-shaped depression on the head of the radius, and is limited to the front and lower part of the bone. On the medial side of this eminence is a shallow groove, in which is received the medial margin of the head of the radius. The medial portion of the articular surface is named the trochlea, and presents a deep depression between two well-marked borders; it is convex from before backward, concave from side to side, and occupies the anterior, lower, and posterior parts of the extremity. The lateral border separates it from the groove which articulates with the margin of the head of the radius. The medial border is thicker, of greater length, and consequently more prominent, than the lateral. The grooved portion of the articular surface fits accurately within the semilunar notch of the ulna; it is broader and deeper on the posterior than on the anterior aspect of the bone, and is inclined obliquely downward and forward toward the medial side. Above the front part of the trochlea is a small depression, the coronoid fossa, which receives the coronoid process of the ulna during flexion of the forearm. Above the back part of the trochlea is a deep triangular depression, the olecranon fossa, in which the summit of the olecranon is received in extension of the forearm. These fossæ are separated from one another by a thin, transparent lamina of bone, which is sometimes perforated by a supratrochlear foramen; they are lined in the fresh state by the synovial membrane of the elbow-joint, and their margins afford attachment to the anterior and posterior ligaments of this articulation. The lateral epicondyle is a small, tuberculated eminence, curved a little forward, and giving attachment to the radial collateral ligament of the elbow-joint, and to a tendon common to the origin of the Supinator and some of the Extensor muscles. 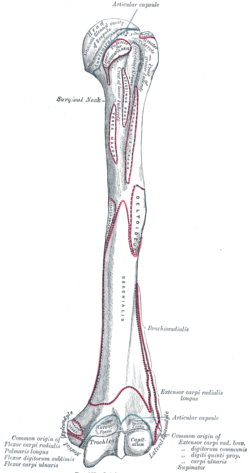 The medial epicondyle, larger and more prominent than the lateral, is directed a little backward; it gives attachment to the ulnar collateral ligament of the elbow-joint, to the Pronator teres, and to a common tendon of origin of some of the Flexor muscles of the forearm; the ulnar nerve runs in a groove on the back of this epicondyle. The epicondyles are continuous above with the supracondylar ridges. Left elbow-joint, showing anterior and ulnar collateral ligaments. This page was last edited on 11 February 2018, at 23:27 (UTC).